It’s May 1, 2014 and NaPoWriMo is over. Time to move on to other things. I reached for my colored pencils yesterday. Before I could use them, I had to wipe a thick layer of dust from the box because it’s been so long since I used them. Colors have a language all their own and I need that right now. Something to fill the gap of the intensity from this past thirty days. For me, coloring is a form of active meditation. Hands are busy, but the mind is free to roam, explore, both feelings and memories. Hopefully gain some perspective after the rush of doing what a poem a day demands. Usually NaPo is a roller coaster ride of intensity: up and down, whirling around from one thing after another. This year was different, much less dramatic and far more like a slow climb or journey. Each day held its tasks and I moved through them with some amount of surety, if one can have such a thing while engaged in the constant energy flow of the creative process. I believe the poems I created reflected that in some manner. They seem to own a bit more of a steadied tone, as well as voice, and I can only be grateful for that. When I got up this morning, I immediately came to the computer. Checked out this site and the one at Soul’s Music. Nothing going on in either place, lol. Decided I needed to post here and fill this space with something else other than that final word list. Went looking for an image and this one struck me as appropriate. It’s a digital painting from a while back. Me playing with colors just to see what would happen. 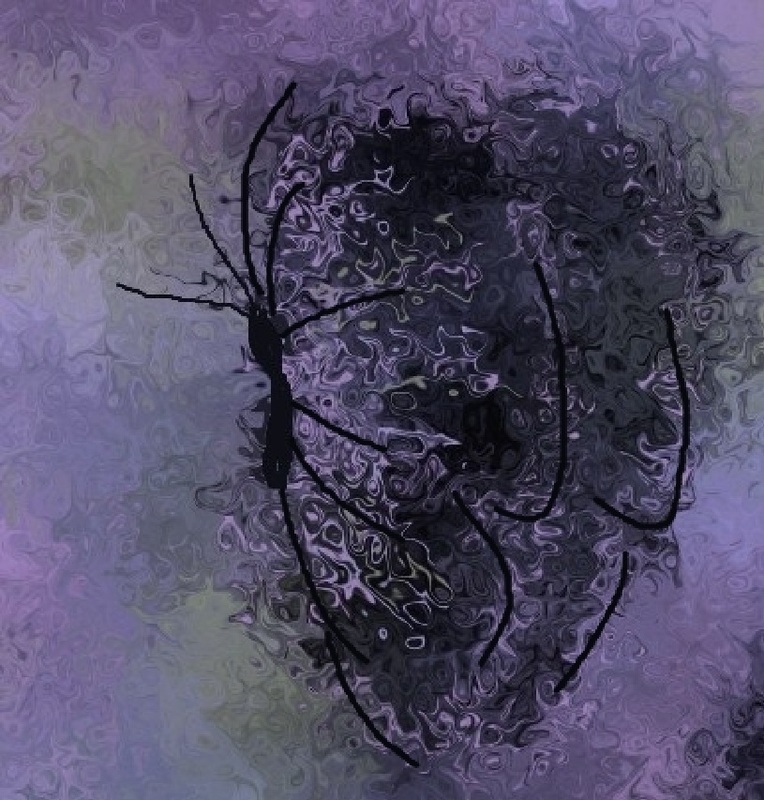 When I saw the butterfly begin to emerge, I decided to define it a bit more and that became the finished product. Butterflies are a symbol of transformation. Each wing signifies one of the four stages in the process of metamorphosis, of change, of becoming something new and very different from what was. Butterflies flit and flutter, seldom moving in a straight line of direction. A lot like the human journey through life. Another interesting fact about butterflies is that they absorb the world around them through their feet: their senses, of taste and even smell, are all located in those tiny appendages. I find that fascinating. This fragile and beautiful little creature, often moved by the wind of chance, seeking nurture to continue life, sucking it up and allowing it to rise through its entire being so that it may move on to the next bit of sustenance. I really like that idea. Walking through my life, one moment at a time, soaking up all these odd bits and pieces, letting them settle within me, nurture me, and allowing me to change, not only direction, but whatever I might need to become. Today, that means listening to the colors and that different language they speak. Is yellow sweet with joy, or a bit sour with disappointment? I can only put myself in the way of that knowing, allowing the wind of change to take me wherever I need to be, while helping me to discover what I might be becoming. What kind or color of butterfly are you today? This entry was posted in Moving On and tagged active meditation, becoming, beginnings, butterflies, change, language of color, metamorphosis, senses in feet, transformation. Bookmark the permalink. Good question, Elizabeth. I feel a bit like a grounded one today, as in not enough lift to fly….sigh. I suppose that is part of the process too…….it is a glorious day here though – so lovely to have open door weather here again. A swallowtail, because I want to fly far, but the odds are against me.